Come February and love is in the air. And why not, it’s a month for lovers. 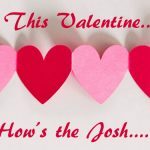 14th February, Valentine’s Day, a day of the year when warmth of the sun not only comforts freezing hands but also fills ones’ heart with a desire to do something out of this world for their beloved. Don’t you love her to the moon and back? While many of you like to stroll with her basking in the genial atmosphere enjoying each other’s company, probably many others are busy planning for the perfect day. From venue to menu and gifts to roses, they want everything to be impeccable for their Moon-pie. But hey, no need to fret at all! This time let your heart rule your head by leaving the entire V-day preparation to us. All you need is to wear your heart on your sleeves and let Mr. Cupid carry you both on a romantic ride. 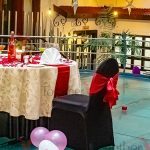 Here are some of the most magnificent TogetherV ways to celebrate Valentine’s Day this year. 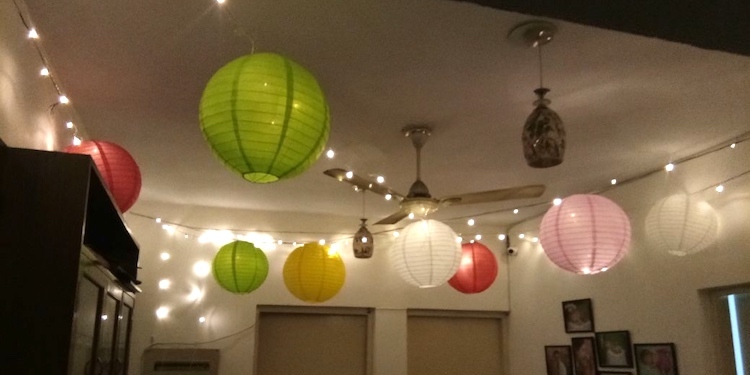 Surprise your partner at the strike of 12 or the moment he/she returns home with a romantically decorated space in your home. Let flowers, balloons, and candles find a perfect place in your home to woo him or her romantically. Spend rest of the evening just the way you like, lazing around, making love or relish a simple home cooked food amongst glimmer lightly scented candles, fragrant flowers. Do make a night to remember! 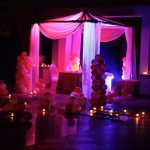 Flower petals, candles, balloons, subtle music and a lavish spread of scrumptious dinner/lunch. We know it’s Biblical, but we bet it, it’s never out of fashion. Make her feel special this Valentine’s Day over a perfect candle light dinner but with a little surprise element. 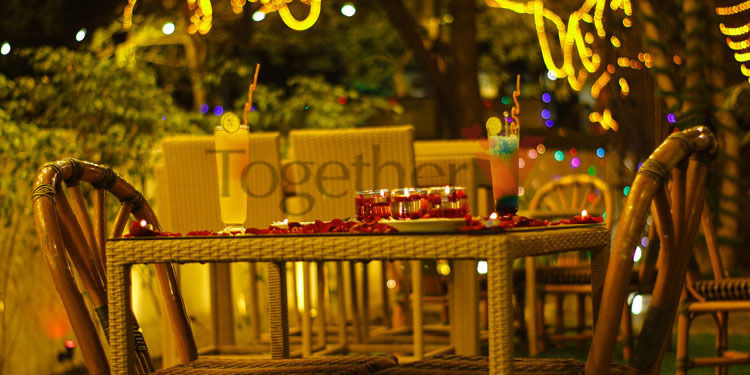 Give her a mesmerising experience and have the exquisite candle light dinner at one of the most romantic venues. You can choose from the following settings. Rooftop – let stars and elements of nature be the witness to the most beautiful union. Airplane wing–it’s unique as well as enthralling. 360 degree view–dazzling view of the city, your love and a perfect candle light dinner. What could be more satisfying? By the Poolside–let water reflect the beauty around as you submerse and soak yourself in eternal love. At the farm–It’s for those lovey-dovey shy couples who like to spend love time in the lap of nature by the camp fire – excellent venue for romance and relaxation. Private candle light dinner–Get up close with your partner at a private space in one of the most radiant restaurants. And satiate your taste buds with a delectable multi course meals. Love struck couples can also choose to stay back after a satisfying candle light dinner in one of the most beautifully done rooms of the property. 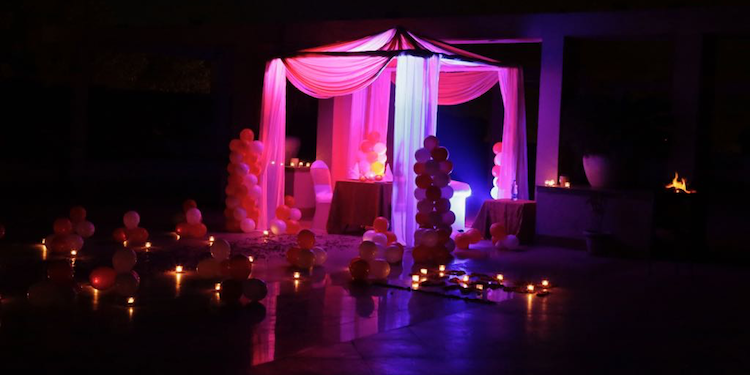 Balloons, candles, and flower petals will all be there to give the love smitten couple a warm welcome to their paradisaical room. 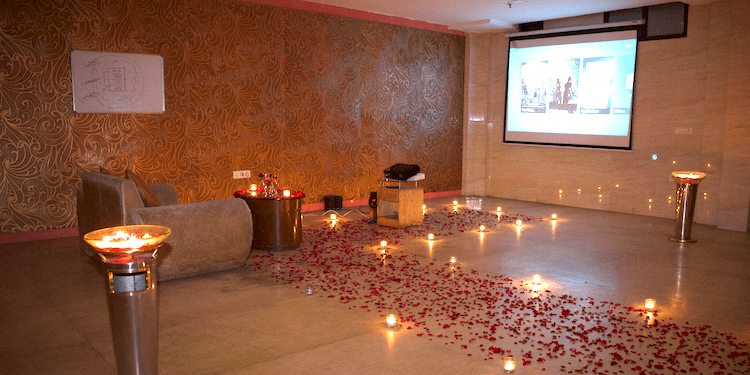 Give her a pleasant surprise with a love message written with flowers on the floor. If you’re feeling fancy, you can further customise the experience with personalised gifts and much more. Some people like to take their beloved for a romantic candlelight dinner while others may choose this day to propose their sweet heart. 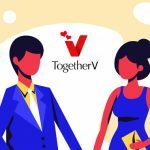 We at TogetherV, have something very exquisite to offer to the love struck couples. Spend time with your beloved over a private screening of a romantic movie and relish perfectly cooked dinner. You can choose to play a short picture movie of beautiful memories with her to sway her away to a charming world in style. And when she is all soaked in love, propose her! 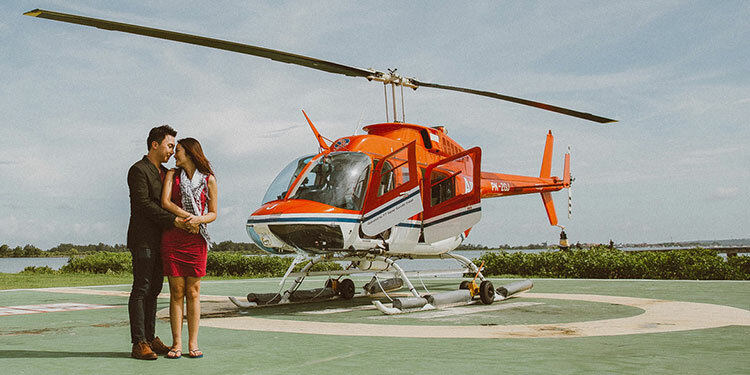 Chopper ride–Perfect way to propose her in the middle of the air. 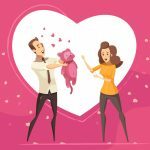 Pottery classes–Mould clay in a romantic way with her to create a perfect love mascot. Paragliding–Sky is the limit for two hearts deeply in love with each other. Golf–Know more of her over this beautiful game played on the green fields under the bright The Sun on a beautiful February day. Escape games – Solve a mystery and be her real life hero! You can completely customise the experiences described above as per your desires and taste. Add a touch of perfection to each of the experience and participate in the creation of that perfect moment. Gifts like hand in hand mould, exotic flower bouquets, customised cakes, photo of photos; get in touch with us, and we will help you to spin the perfect memory this Valentine’s Day.